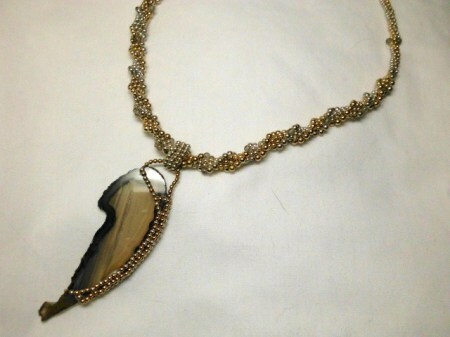 Gray Agate pendant necklace on a sterling silver lobster claw clasp. 17" necklace of alternate rows of 2mm,3mm sterling silver and 14k gold, 3mm labradorite beads and a removable 3.5" gray agate slab with sterling silver bead bezel on a 3 bead band and sterling silver lobster claw clasp. Pictured in Bead & Button Magazine.